Diffraction: When waves encounter an edge, an obstacle, or an aperture the size of which is comparable to the wavelength of the waves, those waves spread out as they travel and, as a result, undergo interference. 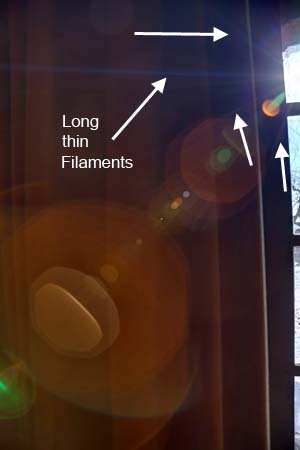 Diffraction though an aperture: When the ratio of aperture diameter to wavelength is relatively small (10^4 or smaller), edge diffraction from the aperture stop from out-of-field sources can be a significant source of stray light. The sun and the window are at the right of the image but they were shining (in the object space) from the top side of the camera (i.e. the flash "hot-shoe" side). Long and thin streaks of light irradiate from the sun (that is out of the field of view). This is typical of effect of diffraction though the aperture: they makes an obstacle on the light wave front, resulting in the radiating lines. These lines start all at the source of bright light and besides the brightness of the light, their length depends also on the shape of the iris: the better circular it is, the shorter are the filaments. The total number of filaments depends on the number of sides of the polygonal iris: the number is the same as the even number of sides. If it is an odd number, then the number of streaks is twice as much (with alternating short and long radiating filaments). This shall happen where ever the sun is located in the field or out, while this is more visible if the aperture opening is small (f/11 and less). The sun was here shining from the underside of the camera. The effect of edge diffraction through the aperture is apparently reduced here, but this is due to the automatic contrast correction that was applied in post processing: because of the other flare effects (mainly veiling glare) that overpowered the image the correction was biased and dwarfed the phenomenon almost completely. 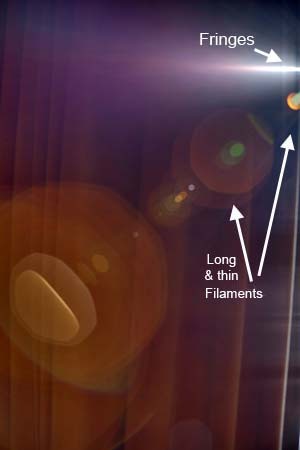 (As suggested in §2 "Singly Scattered flare"): after being reflected from the ceiling of the mirror box, the light beam might well be diffracted -at least partially- on the thin edge of the imaging sensor: White lines parallel to the long side would then be interference diffraction fringes . Edge-diffracted stray light is here entirely due to the lens design or lens manufacture.